We are looking forward to our third solo exhibition with current drawings by Thomas Müller, which we are showing parallel to Art Cologne ( 11. - 14.4.). Like a meandering river, the stream of his drawings moves between different forms of expression and techniques. He creates extremely minimalist pencil drawings next to sheets of paper, for which he simultaneously uses pencil, copying pencil, chalk, acrylic and oil paint. One materiality refers to the other. Transparent colour gradients cover the surface with countless lines. The repetitive themes include works with often green oil colour lines printed directly from the tube as well as blue and black ballpoint pen, pencil and silver pen drawings drawn line by line. Thomas Müller has been working exclusively in vertical format for many years. The most comprehensive group are his small-format, DIN A4-sized drawings. At the same time he works on very large laid paper ranging from 160 x 115 cm - as for our exhibition - to 255 x 183 cm. Thomas Müller (* 1959) lives and works in Stuttgart. His works have been shown in important museums such as Kunstmuseum Bonn, Hamburger Kunsthalle, Kunstmuseum Stuttgart, Gemeentemuseum Den Haag and Centre Pompidou in Paris. They are part of important public and private collections in Germany and abroad. 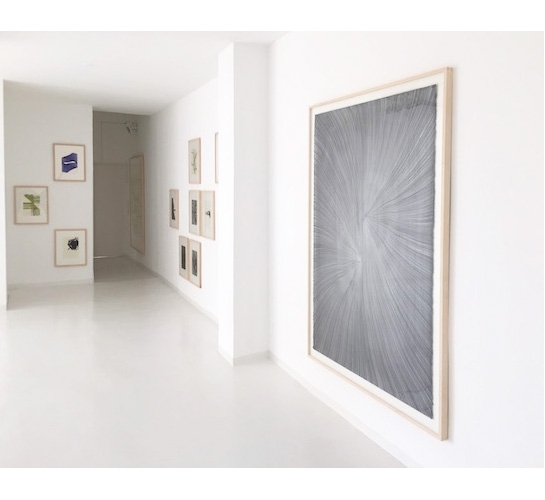 Last year, at the invitation of Sean Scully, drawings by Thomas Müller were exhibited in a solo exhibition in his studio in New York.